Welcome to the fascinating world of kilnformed glass. 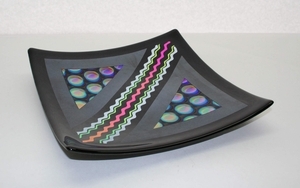 Glass Fusing or Fused Glass is the process of using a kiln to join together pieces of glass. If you apply heat to glass, it will soften. If you continue to apply heat, the glass will become fluid and flow together. Education is a primary mission of Blue Dolphin Art Glass. We offer classes in beginning to intermediate glassworking method with a primary focus on kilnformed glass and torchwork. Please take a minute to visit our Classes page for a list and detailed discription of available classes. At Blue Dolphin we carry a full line of glass fusing supplies. In our store you will find both Bullseye 90coe and Spectrum 96coe glass, all the frit, stringers, confetti, Olympic glass kilns, slumping molds and glass paint you could possibly want. In addition to a extensive line of glass fusing supplies we boast a very friendly and helpful staff. Not ready to purchase a glass kiln? Don't let that keep you from experiencing the wounderful world of glass fusing, let Blue Dolphin fire your pieces for you. In our kiln working studio we have several diffrent kilns that will accommodate almost any project. Coldwork What is the coldworking process? Coldworking refers to processes that takes place outside the kiln. This includes everything from basic grinding and cutting activities to more elaborate processes using specialized equipment. Coldworking a fused glass piece that is less that perfect can be a real life saver. Coldworking can polish, reshape, and greatly enhance the appearance of almost any piece of fused glass. If we can help you with the coldwork finishing of one of your fused glass projects bring it into the store and we will estimate the cost of the coldwork necessary to enhance or rescue you beloved work of art.